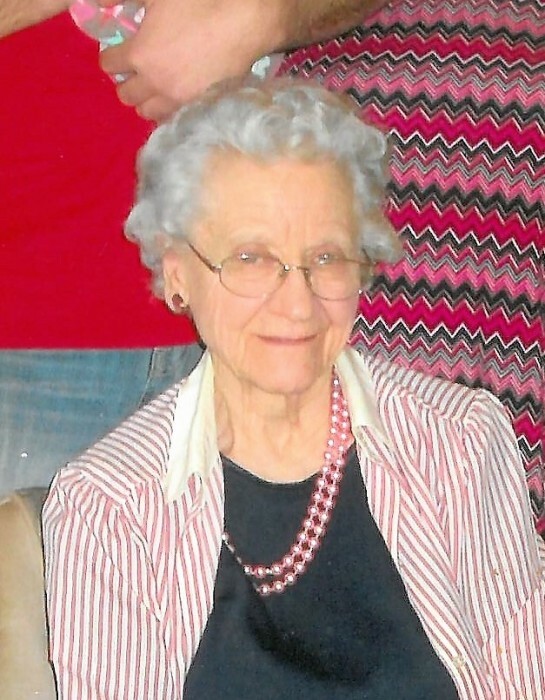 Obituary for Olive Irene (Parkinson) Smith | Swan Valley Funeral Services Ltd.
On December 24, 2018, Olive Irene Smith of Swan River, Manitoba, formerly of Bowsman, Manitoba, passed away at the age of 97 with family members at her side. Olive was born on October 3, 1921 in Birch River, Manitoba to William and Martha Pearl Parkinson. She was educated at Drury School. In 1942, Olive married Lynden Russell Smith. They lived in Bowsman for many years where Lyn was an elevator manager and Olive was a homemaker. They were blessed with four children; Irene who passed away in infancy, James (Jeanne) of Swan River, Patricia (Melvin) Davy of Birch River, and Cameron (Rachelle) of Winnipeg, Manitoba. Cameron was a high school English teacher and passed away at the age of 30 in a tragic car accident on his way to work in Treherne, Manitoba. Olive was a dedicated wife and mother, devoting her time and energy to her family and home. She was an excellent cook and seamstress. Her garden was large and well kept. She preserved a lot of the vegetables that she grew. She lovingly babysat Shawna and Marla. All of her grandchildren loved her delicious cinnamon buns. She kept her house meticulously clean. She was the “quintessential domestic engineer”. Olive was talented and creative, playing the piano by ‘ear’ and drawing and painting like a true artist. She found time for her church group. She loved to go dancing. Among our many happy memories are those involving celebrating family Christmases at Mom and Dad’s, where the house was beautifully decorated, and the meal was splendidly prepared and presented. We also enjoyed the gorgeous flowers in their garden during the summer time. After Dad’s passing in 1988, Olive married Gordon Dyer. As with Dad, she enjoyed playing cards, camping, and fishing with Gordon. Mom had a good sense of humour. She displayed resilience in the face of adversity and loyalty to her family and friends. She was compassionate and generous to those in need. Mom took great pride in her grandchildren; Shawna (Steve) Annear, Marla (Derek) Boychuk, Scott (Genie) Davy, Andree (Wade) Repta, and David Smith. She was delighted by her great grandchildren; Riley, Jaime, and Jonas Annear; Samara and Jillian Boychuk; Olivia Davy; and Emelie Repta. She was also very interested in her nieces and nephews. Olive is survived by her half-sister Carolynn and her half-brother Harvey Parkinson and many nieces and nephews. She is predeceased by her parents William and Pearl; her infant daughter Irene; her husbands Lyn and Gordon; her son Cameron; and her brothers and sisters Cecil, Marjory, Vera, Dorothy, Chester (Joe), Arthur (Swede), Muriel, John and Adeline (Teeny). We will greatly miss Mom, but we take comfort that she has rejoined her loved ones in Heaven. An evening viewing was held on Wednesday, January 2, 2019 at 7:30 p.m. from the Chapel of Swan Valley Funeral Services. The funeral service was held on Thursday, January 3, 2019 at 2:00 p.m. also from the Chapel of Swan Valley Funeral Services with Pastor Ferlin Abrahamson officiating. Interment followed in the Bowsman Cemetery. If friends so desire, donations in Olive’s memory may be made to the Alzheimer Society.